I’m happy to announce that I have a full page in the newest issue of Longshot Magazine, a publication produced over 48 hours from 3 p.m. July 29, 2011, through 3 p.m. July 31, 2011. 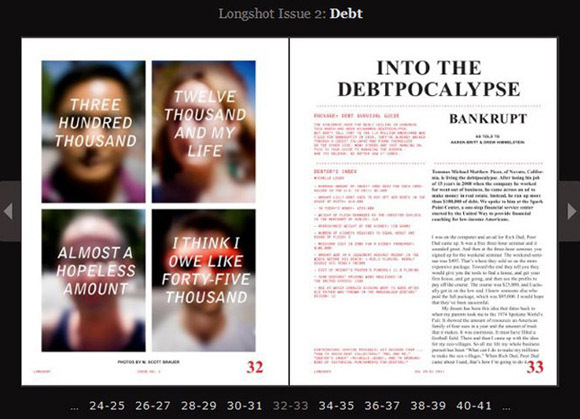 The theme, “Debt,” was announced, and all contributors and editors worked for the next 48 hours to produce a full print publication. A small army of editors and designers worked behind the scenes to make the magazine, its web presence, and a radio and podcast component. And all of the magazine’s content was created by another army of writers, graphic artists and photographers. Many of the contributions are available online, but some (including mine) are reserved for the print issue alone. It was an open submissions process during the 24 hours after the theme was announced at noon on Friday, and there are plans to publish online all 672 submissions made to the magazine over the weekend. The magazine has been getting some good press mentions. There’s a huge list of sponsors for this issue, which includes money from a a kickstarter campaign that raised more than double the desired amount of money. Best of all, through these sponsorships, contributors to this issue, which was primarily a labor of love for all involved, will be paid. Here is a selection of my work for the magazine.